Amongst the many characteristics of the fascinating naked mole-rat is an exceptionally long lifespan in relation to body size, making it an outlier among mammals together with humans. Two recent studies published in BMC Biology address the questions of how naked mole-rats can live so long and maintain an exceptional reproductive capability, and if naked mole-rats actually do show any sign of aging. Lead authors of those studies, Martin Bens and Alessandro Ori, explain their findings. Naked mole-rats (Heterocephalus glaber) are mouse-sized rodents that live in the East African savanna below ground, where they build extensive tunnel systems. Uncommon for a mammal, they have developed a eusocial lifestyle, like a “superorganism”. A naked mole-rat colony consists of a female queen and male pashas, who are the only reproducing members of the colony, and up to 300 subordinates, such as male and female workers. Usually, only one queen and one pasha are devoted to reproduction, whereas their subordinates do the rest of the work: brood care, foraging, enlargement or defense of their underground tunnel system. Naked mole-rats are very exciting animals, not only because of their unique lifestyle, but especially as a model organism for aging research. During their long life, they exhibit exceptional traits: Naked mole-rats are fertile throughout their lives, have a high resistance to infection and generally do not suffer from age-related diseases such as cancer or diabetes. These characteristics differentiate them from humans and other rodents like the guinea pig and mouse. Even though naked mole-rats (NMR) are quite small, queens can live as long as 30 years – compared to 4 years for the mouse, and a maximum of about 12 years in the guinea pig – the most closely related model organism to the NMR. The disposable soma theory of aging hypothesizes that energy – for example from food sources – is often scarce, and can therefore be invested either in the maintenance of somatic tissues (contributing to individual survival or “lifespan”) or in reproduction. This may explain why animals, confronted with a high mortality risk due to extrinsic factors, are likely to invest their energy in reproduction. Thus, they contribute to the survival of the species, but limit the lifespan of individuals. Vice-versa species confronted with a low-extrinsic mortality are more likely to invest energy to keep their bodies healthy, enabling a longer reproduction phase during the longer life. Among mammals, body mass usually correlates with lifespan, and smaller species generally live a shorter life. However, the naked mole-rat seems to defy the ‘disposable soma’ theory, as the reproducing queen of a naked mole-rat colony can actually live longer than its subordinates. Naked mole-rats build extensive tunnel systems and live a eusocial lifestyle. In the paper from Martin and colleagues, we investigated this theory in naked mole-rats, as these little animals have a lifelong fertility, an extreme reproductive rate and a long lifespan. In contrast to workers of eusocial ants and bees, in a colony of naked mole-rats even workers are capable of reproduction. However, their sexual maturation is suppressed by the presence of the dominating breeding pair. We took male and female non-breeding workers from their colony and paired them with an unrelated partner from a different colony. In this way, these non-breeder animals turned into breeders. We then used genomic approaches based on RNA sequencing to investigate tissues of these new breeders and compared them to those of guinea pigs. We found that about 59% of the analyzed genes between naked mole-rats and guinea pigs are differentially expressed, and that these are significantly enriched for aging-related genes, showing that naked mole-rats have unique characteristics compared to their close relatives, which might explain differences in lifespan. In contrast to non-breeding guinea pigs, non-breeding male and female naked mole rats are not sexually dimorphic; they show no differences in body size, body mass or external genitalia, as well as few behavioral differences. Consistent with this we found virtually no significant transcriptional differences between non-breeding female and male naked mole-rats (unlike in the guinea pigs). However during the course of sexual maturation, sexes of naked mole-rat workers became not only distinguishable by morphology and behavior, but also by the gene expression profiles of their tissues. The results also show evidence concerning an extended lifespan: If naked mole-rats undergo the process of sexual maturation thus becoming breeders, they show molecular signatures linked to an extended life- and health span. Contrary to that, in guinea pigs such molecular networks diminish after reproduction. This may help explain the longer lifespan of naked mole-rat queens and pashas. Recent research based on demographic profiles of naked mole-rats claimed that the risk of mortality of these animals does not increase with age, suggesting that naked mole-rats defeat the aging process (Beltrán-Sánchez et al. and Ruby et al.). 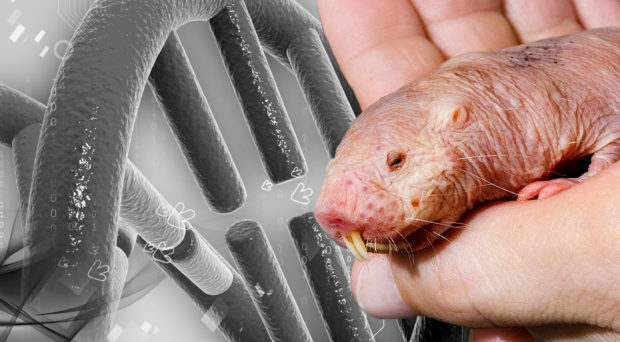 Alessandro’s group, as a team with researchers from the Leibniz Institute on Aging – Fritz Lipmann Institute (FLI) and other institutions, investigated aging processes in naked mole-rats using a combination of proteomic and genomic approaches to try to get a detailed picture of what happens as NMRs age. In our study, we analyzed molecular networks that distinguish long- from short-lived species by comparing liver samples from naked mole-rats to guinea pigs. We revealed differences in the composition of mitochondria of naked mole-rats and guinea pigs. Mitochondria – widely known as the “powerhouses of cells” – unsurprisingly generate energy for the cell, and we confirmed preferential ways of generating energy between these long- and shorter-lived species. We also identified signs of aging in naked mole-rats on a molecular level. By investigating the livers from young and old naked mole-rats, we could detect age-dependent changes in protein levels in these animals. Interestingly, a group of proteins responsible for eliminating toxic substances was similarly affected by aging in both naked mole-rat and human liver samples, suggesting that the aging process of these species has some similarities. With regard to the previously presented thesis that naked mole-rats do not age, the results support the notion of a low, but existing aging process in naked mole-rats. It remains to be demonstrated, however, whether the aging affected pathways influence the health of old naked mole-rats and limit their lifespan, as they do in other model organism of aging such as roundworms. Naked mole-rats and humans represent two outlier species because they both have an exceptionally long lifespan relative to their body mass. Identifying networks of molecules associated with longevity through comparison of long- and shorter-lived species could help scientists to find new ways of promoting a long and healthy life in humans. Martin Bens is a bioinformatician at the Leibniz Institute on Aging - FLI. During his years as a Ph.D. student in the Platzer Research Group at the FLI, he focused on comparative genomics and phylogenetic analysis of non-model organisms in aging research. Alessandro Ori earned a master degree in medical biotechnology from the University of Bologna and a PhD in biochemistry from the University of Liverpool. He was a postdoctoral fellow at the European Molecular Biology Laboratory in Heidelberg in the laboratory of Martin Beck. Alessandro has pioneered the integration of genomic and proteomic data to study the impact of aging on the mammalian proteome. His current research aims at the identification of determinants of longevity and molecular networks altered by aging using different model organisms including the exceptionally long-lived naked mole-rats.